I have not done any problems like this yet, but I put this image together to help the student of geometry. I hope it helps. Below, I write a paragraph proof. To really understand this problem you have to remember the ways to prove lines parallel: the converse of the corresponding angles postulate, the converse of the alternate interior angles theorem and the converse of the same-side interior angles theorem. So, to prove that segment AB is congruent to Segment CD. The shortest way to complete this proof is to show that either angels MAB and MDC or angles MBA and MCD are congruent. 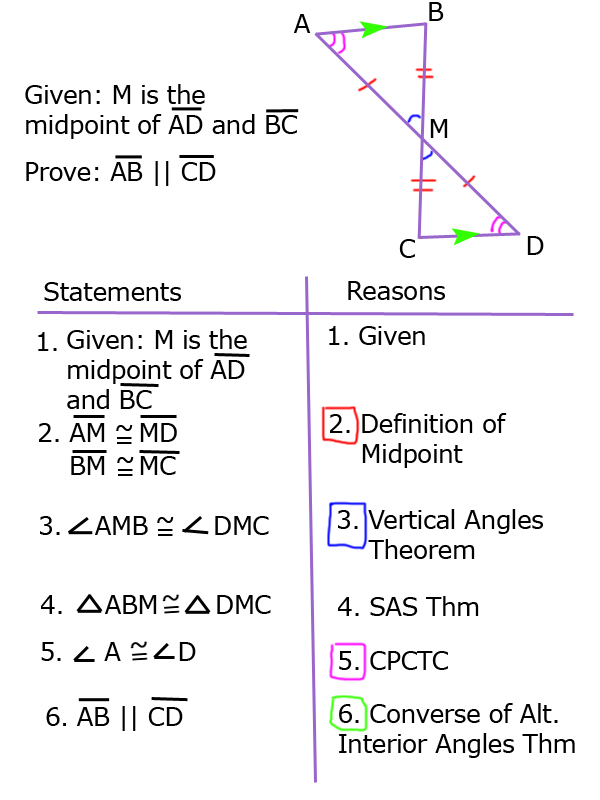 To prove those angles congruent, triangles ABM and DMC must be proved congruent. I color coded the markings on the diagram with the proof. I like to start with a blank diagram and mark my corresponding congruent parts as I go. It helps me develop my proof. I hope this technique helps you. I encourage you to use different colored pencils to mark your diagram is my coloring coding helped you follow this proof on how to prove lines congruent with triangle congruence. The more I think about this blog post, I think it should be titled Proving Lines Parallel with Triangle Congruence SAS. Though this proof uses SAS to prove the triangles congruent, anyone of the other triangle congruences could be used to prove triangles congruent. Then the alternate interior angles could be proved congruent by CPCTC. I don’t think you you will be needing sas,sss, and others because all you have to do is to look at the alternate interior angles, for example angle A and angle D. if they are equal, then AB||CD. That is by Euclid’s 5th postulate. I agree, if the alternate interior angles are congruent, then we could state that the lines are parallel, but in this example if you read the given closely, you will notice, that angles A and D are not given as congruent. The marks on the diagram were put on as I wrote the proof and are color coded in the two column proof with the boxes around the steps. No need to apologize Guillermo. That is apart of learning and sharing information. How would I go about proving that lines AB and CD are congruent if the statements “M is the bisector of AD” and AB and CD are parallel were given? I’m having some trouble with Honors Geometry homework and can’t find it in the textbook anywhere! Would we be using the same diagram as I have in this blog post?